When I first got into cooking there was one thing I really wanted to master: the ultimate Sunday dinner. I figured I couldn’t consider myself a good cook unless I could do a really good roast chicken. Obviously this is a very sacred meal so I’ve made sure I’ve practiced several times and got my technique down to a tee before sharing with you. As much as I like other roasts, a nice rib of beef or a leg of lamb are my particular favourites. 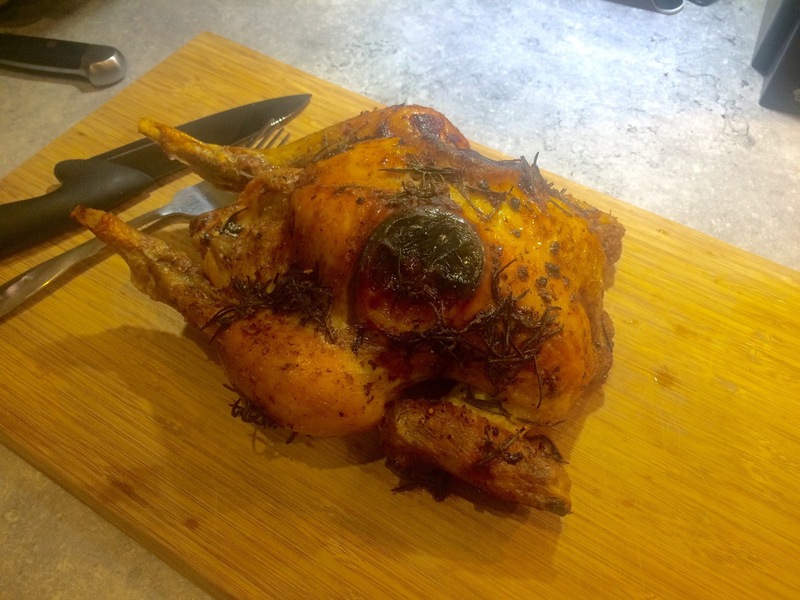 There is something more satisfying about achieving the perfect roast chicken. Especially at this time of year, there’s nothing more satisfying than having a good old roast dinner on a Sunday. It is a British tradition after all. However, this seems to be the only thing people do with a roast chicken, serve it with potatoes, yorkshire puddings and gravy. It doesn’t always have to be this way. You can go more Mediterranean with oven roasted vegetables on the side with spicy cous cous or rice. 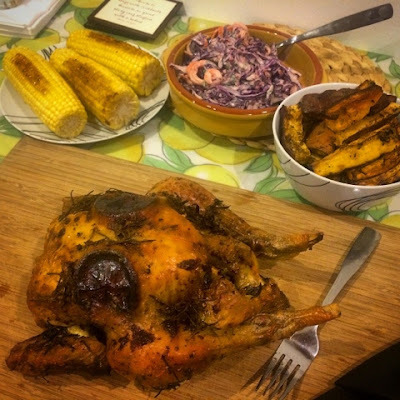 With this particular chicken I ran with the good old American South as my theme and sweet potato wedges, coleslaw and corn on the cob were my accompaniments. Once you’ve mastered the technique and timings of a roast chicken, you can really start having fun with the flavours. Classic lemon and herbs will always be good, but it’s so easy to throw different spices into the butter mix and really play around with it. My aim is to use a jerk marinade and have a whole jerk chicken for Sunday lunch one week! 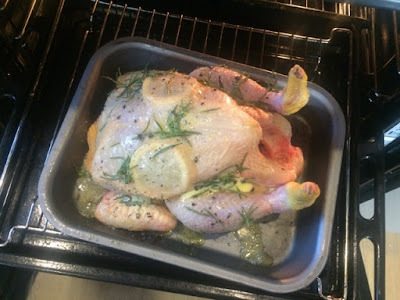 I’m entering this recipe into Karen’s Cooking with Herbs Autumn recipe link up. I love having fresh herbs in the house. Despite my disastrous attempts at gardening this summer, it turns out my balcony is insanely windy and plant pots were committing suicide on a daily basis, I now have a growing collection of herbs on my kitchen windowsill (indoors) and snip a few off to add a bit of freshness to pretty much every meal I cook. 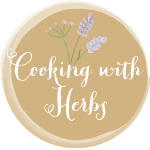 Follow the link to check out some other great ideas of how to use herbs to enhance your cooking. 1. Preheat oven to 220ºC. 2. 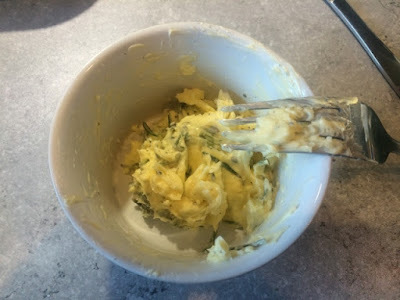 Mash up the butter in a bowl and mix in the herbs, season with plenty of salt and pepper. 3. Completely cover the skin of the entire chicken with the butter, use your hands to rub it in everywhere. 4. Stuff the lemon quarters into the neck of the chicken and gently peel back the skin to slide the slices inbetween the skin and the flesh where possible. Pour the wine over the chicken. 5. 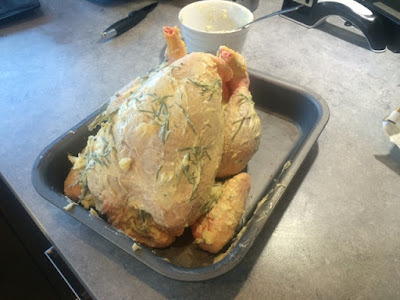 Place the chicken in a roasting dish in the oven uncovered. After the first 20 minutes turn the oven down to 190ºC. The total cooking time is dependent on the size of the bird. Check the weight of your bird, 20 minutes per 500g plus and extra 20 minutes on top is a good rule of thumb. After each 20 minute interval, pull the chicken out of the oven and baste in its own juices (spoon the juices collecting in the tray over the top of the chicken). The skin should go nice and golden and crispy but if it’s browning too much just cover the bird and tray in foil. 6. Check the chicken is cooked by inserting a skewer into the thickest part of the leg, if the juices run clear that indicates the chicken is cooked through. 7. Remove from the oven, place on a rack or board and leave to rest for 10-15 minutes before carving.